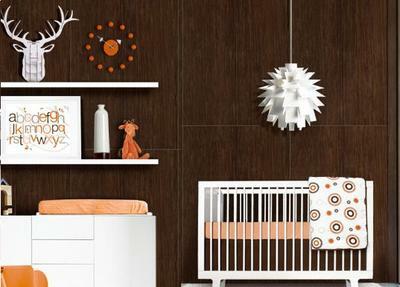 The orange and brown ABC nursery decor that we see in the picture is a room that has a definite modern as well as a rustic or "woodsy" influence provided by the deer decorations and toys. The nursery's color scheme includes the colors of autumn. The white deer head wall decoration really stands out against the chocolate brown nursery wall and transforms a piece, that would by many be considered a wall decoration for a rustic baby nursery theme, into a contemporary decoration suitable for the most modern of rooms. 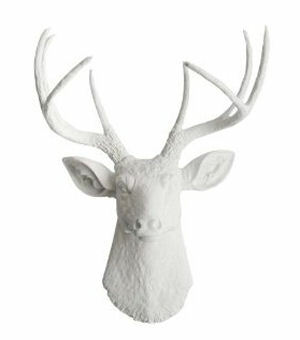 If a white deer isn't your taste you may be pleased to know that you can find something similar in other colors. I found a white 8 point buck with (surprisingly? )hot pink and blue antlers. What a conversation piece! However, solid white works best in this space. The chocolate brown walls create a cozy atmosphere but the room might be too dark without the orange and white accents that keep the nursery bright and cheery. 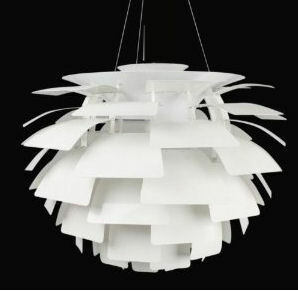 The modern, artichoke pendant ceiling light does double duty as a crib mobile located directly within baby's site over the baby's crib . For the record, I didn't design this room and don't think that the location of the pendant light is a great idea because the light would shine in the baby's eyes. But it looks good in the nursery pictures, right? The orange nursery decorations complete the color palette inspired by the baby bedding set. 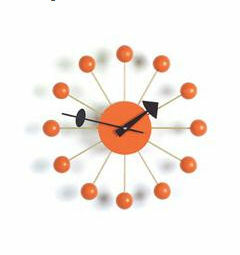 The orange balls of the wall clock repeat the circle pattern of the crib set's fabric. The framed alphabet print holds all the colors of the room which is expected since it's included in the Ollie & Lime Billie baby bedding set collection. The framed ABC nursery art has a vintage feel that is in direct contrast to the design of the crib set which is why the deer wall hanging works so well. As I mentioned; I didn't stage the orange and brown nursery decor and if I had, I would have replaced the elephant (I don't know why they popped an elephant in the room considering the deer themed elements) with a comfortable but modern chair where mom and dad could sit and read to their baby. 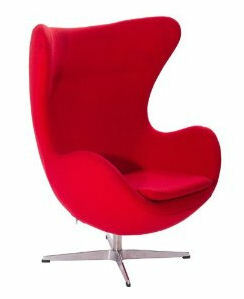 Seating of this type is attractive and is as appropriate for a baby's room as a home office. 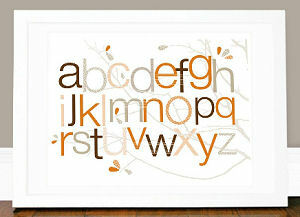 Notice how the orange and brown ABC nursery decor reflects the color and style of the baby bedding. It is SO much easier to accesorize and plan the room according to the crib set than the other way around. So many parents (and decorators) learn this lesson the hard way. Start decorating as early in the pregnancy as you possibly can so that you have plenty of time to relax and enjoy the process. Spreading things out allows for delayed delivery times of key items and gives you time to return them if they don't work. Don't be afraid to try several area rugs, pictures for the nursery and to experiment with the layout of the room to see what you like best. Be flexible and willing to change your mind since even the best decorating ideas can change once you see them in place. Starting early will also give you a chance to check out what everybody's doing on Youtube, Pinterest and in the gallery of nursery pictures on Unique Baby Gear Ideas. Another benefit of decorating the baby's room early is that you have time to tackle a few DIY projects that may save you money or to try your hand at a few crafts that will personalize your baby's nursery. You are welcome to ask any questions or to share your opinions about the orange and brown ABC nursery decor using the comments form on this page. Join in and write your own page! It's easy to do. How? Simply click here to return to ORANGE NURSERY PICS.